Kay Thompson, DDS was the first woman student in the University of Pittsburgh Dental School, the first woman president of the American Society of Clinical Hypnosis and the first of everything else that she decided to try. As a young dentist, she wanted to study hypnosis to help the numbers of people who had dental phobias and went to Milton Erickson for her first weekend of training in hypnosis. The following Monday morning, a woman about to deliver her baby was rushed into her office with a lacerated jaw. Because she was about to deliver, Kay could not give her anesthesia, and said, in her Pittsburgh drawl, “I just took a class from some guy in hypnosis, do you want to try it?” The woman moaned, “I’ll try anything.” Kay did what Dr. Erickson taught her. The woman went into a deep trance and came out totally relaxed and comfortable. Kay said, “I was sold.” She went on to do pioneer work doing hypnosis with hemophiliacs who learned how to stop their bleeding without the use of medication. For seven years she fought in court against Blue Cross and Blue Shield on behalf of the Dental Association – and won! She worked with Milton Erickson for twenty-seven years and what she absorbed from him, consciously and unconsciously, she made her own. 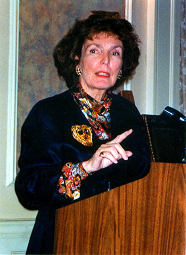 She wrote many papers and received many awards of distinction in Europe and America. Kay’s genius came from her heart. She not only taught the hypnotic connections we can make, she lived them. Even in small unexpected moments, she could shift people’s states of consciousness so brilliantly that they recognized later that something profound had happened to them. Kay could unhook habitual word associations to free the unconscious to play. She took delight in wordplay, alliteration, metaphor and could dance with the unconscious of the artist and subject. Working with her was an adventure for most dental patients who often came out of her office smiling. The knots that we didn’t know how to unknot.